The sun was bright yet ineffective as Fran crunched along the park’s gravelly path, Poppy straining against her lead in her eagerness to run free. It was a daily ritual and Poppy knew that in just a few minutes she would be released onto the huge expanse of grass, where she could stretch her muscles and feel the air rushing towards her furry face. It was her favourite part of the day, closely followed by yapping at the postman and attempting to bite him through the letterbox. It was also Fran’s favourite part of the day on days such as these, when the sun was shining and she could fill her lungs with fresh, sharp air, forgetting her rotten love life for half an hour or so. She wasn’t so keen on walking Poppy when she was thigh-high in snow or flailing about on the frozen pavements. But the bad days only enhanced her enjoyment of the glorious ones. And today was a glorious day. The weather was cool yet dry and cheery and Poppy hadn’t even attempted to nip the coffee vendor’s ankle. “Here you go, girl. Off you go.” Fran crouched to unclasp the lead and scratched behind Poppy’s ear before the dog tore off into the distance. Fran removed the plastic lid from her coffee cup and tossed it into a nearby bin. The coffee was satisfying both in its heat and the instant hit of caffeine to Fran’s sluggish system. She’d had a bad night’s sleep again, thinking about him. She’d been quite good lately, only wallowing once or twice a day, but last night had been a tough one. Grasping hold of the rubber ball in her pocket, Fran whistled to catch Poppy’s attention. The dog bounded towards her, knowing it was time to play. Fran threw the ball as far as she could, holding her breath as it thudded to the ground and another dog bounced towards it. Poppy was not the most sociable of animals and it had taken months of trial and error to pinpoint the quiet times at the park and even then Fran always ensured there were no other dog walkers before removing the lead. But instead of snarling and snapping, Poppy tore after the dog and a friendly chase ensued and the only yapping to be heard was of the happy variety. Fran was gobsmacked. Poppy had never played with a fellow dog before and Fran hadn’t thought it possible. Poppy had always been a grumpy old goat when it came to other dogs. And human beings other than herself. Her ex-boyfriend had branded Poppy "the devil in fur". She should have known the relationship was doomed from that point. Fran held her breath once more but not through fear of a doggy scuffle. The other dog’s owner was tall and slender yet masculine with a mop of thick, black hair and dark stubble. And he was striding towards her! She was babbling. And sweating, despite the chill in the air. “Bruce is very good at winning over the ladies.” He grinned at Fran and she simpered beneath the glare of his perfect white teeth. 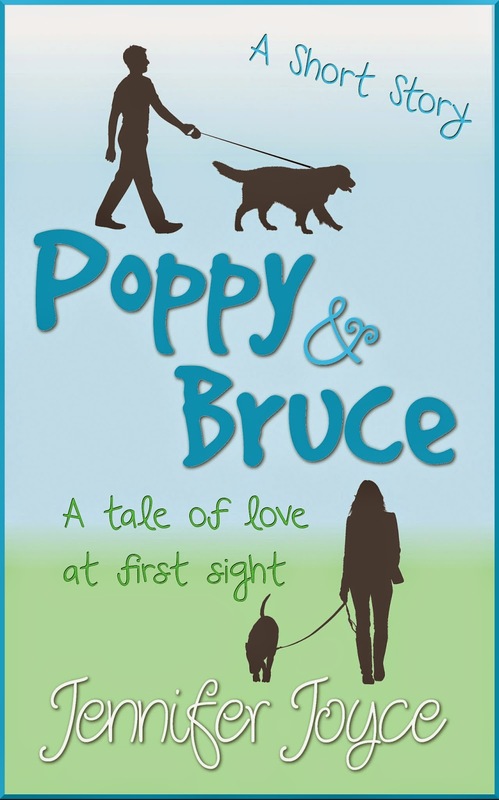 “So it appears.” Bruce was currently sniffing at Poppy’s behind – and she was letting him. Hussy! “I do apologise for Bruce’s behaviour. He isn’t much of a gentleman.” He flashed another grin and Fran’s cheeks glowed. It was definite. Fran fancied him. She fancied a man who wasn’t her ex. Was that even possible? She hadn’t thought so five minutes earlier. “That’s ok. Poppy isn’t much of a lady.” Which she demonstrated rather aptly by having a sniff of her own. Fortunately nothing untoward occurred and the pair tore off, taking it in turns to dodge one another. “Fran.” She shook his outstretched hand, feeling its warmth through her thick gloves. Their hands remained in contact and Fran felt her cheeks warm once again. She dropped her hand by her side and turned her attention back to the dogs. Poppy and Bruce zoomed across the field, stopping periodically for a sniff before resuming the chase. Their tongues were lolling and little clouds puffed out of their mouths and into the cool air by the time Fran and Oliver called them back. “I think Poppy would like that.” And so would Fran. Though they had only just met, she could sense something, a warm jittery feeling in the pit of her stomach that she knew would grow into butterflies. She liked Oliver, for his easy nature and his ability to swerve her mind away from her ex for more than five minutes. “Tomorrow then? Same time?” Oliver asked as he scratched behind Bruce’s shaggy ear. Fran nodded, hoping he wouldn’t notice her flush. Parting ways, the dogs stared longingly back at one another. Fran knew exactly how Poppy was feeling but there was a definite skip to her step during the walk home. Come rain, shine or heavy snow, Fran couldn’t wait for their walk the following day.